Windows are a vital part of humanity that animates life and gives room to breathe. It is also a pathway into one’s individuality, or a space of contemplation, a rest area from ordinary routine. Therefore, the purposes of neatly arranged and appropriately adhered window films are many. A sheet of well installed decorative window film may provide you with opportunities to express your personality and creativity, and/or offer you privacy from scenes and distractions that may otherwise be overwhelming. The Black Out Decorative Window Film is designed to ensure almost 100% opacity and ideal for applications that require absolute privacy or view shielding. 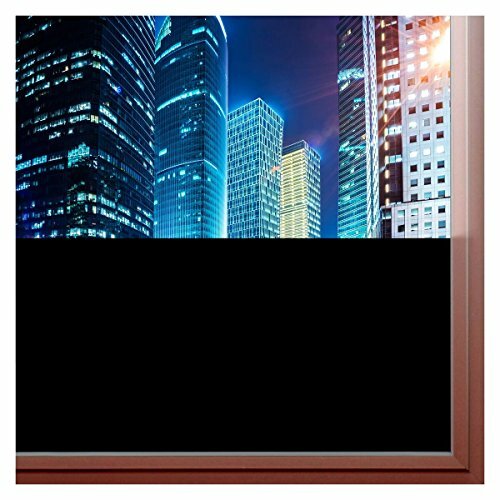 Great for office glass partitions, and conference or study room windows. The film’s complete black tint enhances your concentration and gathers your focus. It is chic; it is modern; it is smart. Durable and scratch resistant. TOTAL AND COMPLETE DARKNESS that blacks out your windows to let absolutely no light through. EXCELLENT 24/7 PRIVACY for rooms that require absolute view-shielding, making it perfect if you don't want anyone to see through your window or glass partition. STRONG ADHESIVES to last many years. For easier installation, remember to use A LOT of soap/water mixture to soak both the adhesive side and window. NOT RECOMMENDED for DUAL PANE WINDOWS. If you have any questions about this product by Buydecorativefilm, contact us by completing and submitting the form below. If you are looking for a specif part number, please include it with your message.